GET BOTH PRODUCTS AT A SPECIAL PRICE AND SAVE! 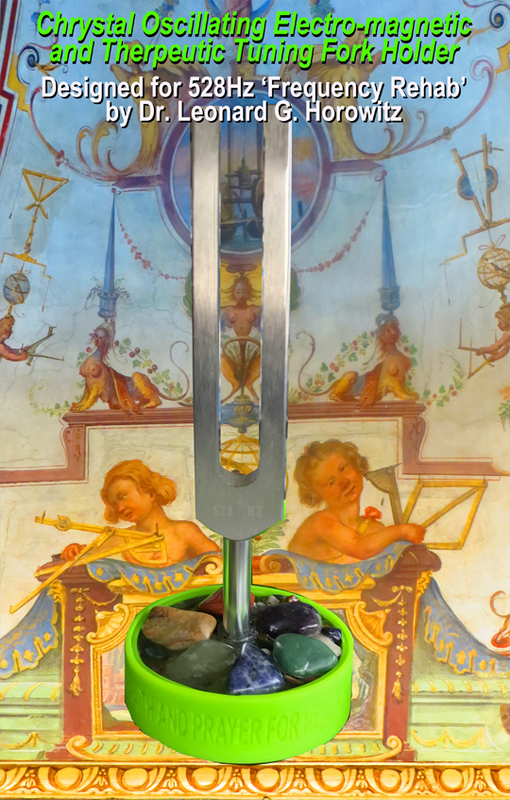 This crystal oscillating 528hz frequency resonating electro-magnetized tuning fork holder with the fork included at a special price, is more than a 'conversation piece' and beautiful clinic addition for energy medicine practitioners. This is 'therapeutic 'functional art' developed by a world leading pioneer in bio-energy self-help technologies. We're talking about the unparalleled natural care-giver and professional trainer, Dr. Leonard G. Horowitz. Dr. Horowitz teaches a 'Frequency Rehab' Course wherein he teaches how you can manufacture such crystal oscillators, if you are so inclined. Otherwise, you can just purchase and enjoy! Dr. Horowitz designed this '528hz Orgone Generator' to output non-Hertzian (scalar) energy, and functionally hold a tuning fork. This crystalline frequency resonator is the size of a hockey puck. It has a strong magnet and copper coil inside a 528Hz (cymatically-crystallized) matrix that holds and transmits this "MIracle Frequency of pure LOVE--"The Universal Healer." This combination is used to remedy pain and inflammatory conditions. Put negatively-charged (alkalizing) electrons into the acidified area by laying the therapeutic puck on the painful spot. This sedates the condition and works amazingly well. The crystallized oscillator and tuning fork holder can be used with most brands of tuning forks. This combo serves as a universal healing and environmental clearing instrument when the tuning fork is struck and placed back into the holder; or simply 'pinched' to start the fork vibrating. The outer green rubber collar around the 528hz crystallized magnetized generator is perfect for striking your tuning fork without marring the metal fork. So this rubber protects the sound quality of each fork. Shown in the image above is a 528hz fork. The non-Hertzian (scalar) waves that broadcast from this instrument (also referred to as an 'orgone generator') is complemented by the magnetic energy field generated by a 13K Gauss magnet. This 'biofield' is amplified by the copper coil in the 528Hz frequency-cured (cymatically-hardened) matrix. Add to this wonderful design beautiful natural gemstones and healing crystals placed throughout this handmade thoughtful self-healing creation. Cured with acoustic (sound) energy for matrix memory of the 528Hz frequency.This is the "MIracle" note for miracle generation, because this is the MIRACLE TONE in the ancient Solfeggio scale. (Read Dr. Horowitz's research.) This is also the "Key of the House of David." (Isaiah 22:22; Rev. 3:6-8). It is also widely known to repair damaged DNA. Recent double-blind peer reviewed studies found this frequency boosted natural immunity (through anti-oxidant activity) 100%, and caused a 20% improvement in central nervous system protection, especially recommended for alcoholics. Click the button below to add the 528hz Single TUNING FORK with 528hz Orgone Generator Tuning Fork holder (528 Tuning Fork Included) to your wish list.